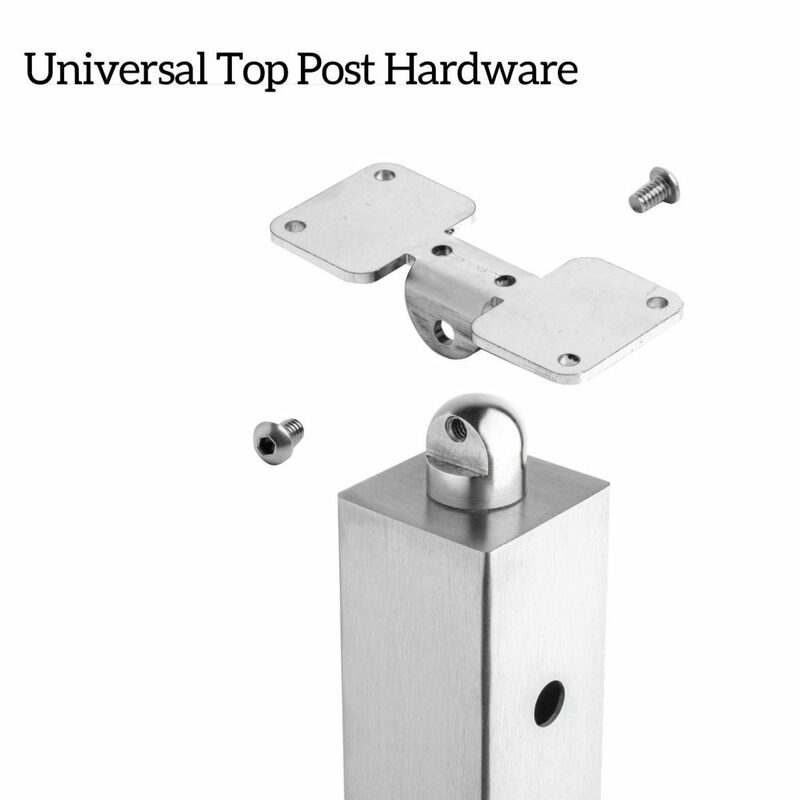 The above products are recommended for installation or mounting of the Special Application Universal Top Square 2" Rod Railing Posts. Adaptable to almost any environment, Surface Mount Posts are the most popular post mounting style. 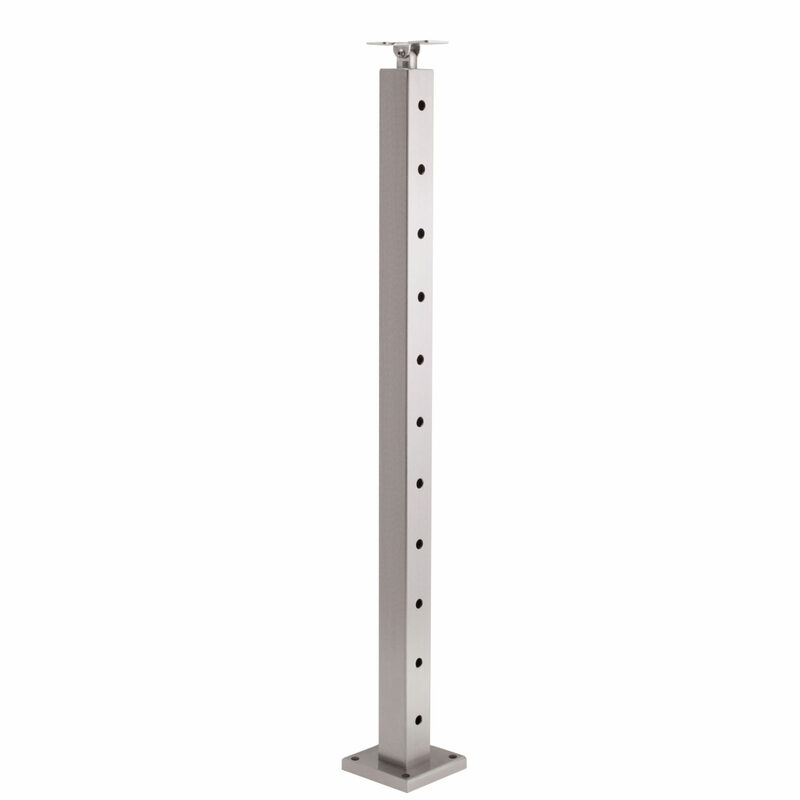 Captivating & customizable, these posts are built from superior stainless steel or aluminum by craftsmen who care. Surface Mount Rod Railing Posts are perfect for decks, treads, and other surfaces. Well-suited for almost any scenario, these posts have earned their acclaim—and they’re ready to prove it. ***If you are ordering Rod Railing Posts for an angled run, please make sure that you have precise measurements (within .25 degrees) of that angle before you place your order. Indicate that measurement in the notes section when you are checking out. This is StairSupplies’ newest product. If you love the rod railing look but don’t see exactly what you’re looking for, give us a call. The product is continuously being refined and we may have the solution you need. “A-5” – The “A-5″ post is designed to be an intermediate post on level runs. It has level holes drilled on both sides of the post. The rods will simply pass directly through the post, no additional fittings are required. “A” – The “A” post is designed to be a starting post on level runs. One side of the post has a hole and the other three sides of the post are completely clean. “B-5” – The “B-5″ post is designed to be an intermediate post on angled stair runs. It has offset* holes drilled on both sides of the post. “B” – The “B” (up or down) post is designed to be a start post on angle stair runs. When choosing “Up” or “Down,” determine whether your run will be continuing upwards or downwards from that post. Then choose the corresponding post configuration. “C” – The “C” post is designed to be a level corner post where one run of rods ends, and another begins (going left or right depending on your selection). It has 5/16″ holes drilled on all four sides. Recommended fittings: “Level Tension End Kits” (36″ – 10 kits, 39″ – 11 kits, 42″ – 12 kits) & “Level Fixed End Kits” (36″ – 10 kits, 39″ – 11 kits, 42″ – 12 kits). “D” – The “D” post is designed to turn a corner from an angled staircase to a level balcony turning left or right. It has offset* holes drilled on one side of the post, and level holes drilled on an adjacent side. When determining whether you select an LH (left-hand) or RH (right-hand) “D” Post, determine whether your run will be turning left or right as you walk up the stair. Then choose the corresponding direction when selecting your post configuration. “I” – The “I” post is designed to turn a corner from an angled staircase and change heights to a level balcony turning left or right. It has 10, offset* holes drilled on opposite sides of the post, and 11 (39″) or 12 (42″), level holes drilled on an adjacent face. When determining whether you select an LH (left-hand) or RH (right-hand) “D” Post, determine whether your run will be turning left or right as you walk up the stair. Then choose the corresponding direction when selecting your post configuration. “S” – The “S” post is shipped without any holes pre-drilled in the post itself (handrail bracket and foot still come pre-drilled). Select this post if you have an application where rods are not necessary but you still want to run handrail, or for a custom application where you want to drill the holes yourself. * All offset holes are drilled at 40 degrees (the typical angle of a staircase), these 40-degree holes work with angles between 36 – 42 degrees. If your staircase falls outside those angles custom hole drilling can be requested at no additional charge. The standard brackets that come with our posts are designed to work with flat bottom handrail, if you order our Round Metal Handrail 2″, we’ll automatically select rounded brackets to work with the handrail. If you have round wood handrail or are ordering an additional post for your project, please specify in the notes if you need a rounded bracket.